Oh, how David agonized over his sin as the conviction was growing so deep that his bones were wasting away. The pain of unconfessed sin was weighing on his strength, and he found himself wasting away and unable to find the energy he needed to function every day. When sin is left unattended, we may not think its hurting anything but deep down, it's wasting our energy. We may even convince ourselves we are doing great because all of our activity may also be serving others to high capacities. But keeping silent about our sin is depriving us of strength. We may also try to fake it until we make it but we will still experience the groans of sin. We may even be able to cover it up in front of our dearest loved ones, but in the sight of God, we are bare. God can see the heart and all that lives deep within us. He knows all about us and yet still chooses to love us, and He still chose to send His son for us. 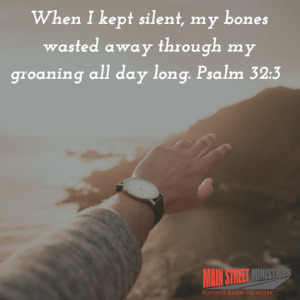 Silence is deadly to our relationship with the Lord because communicating and taking responsibility for our actions, even the silent ones no one sees is where we can put an end to the groaning. It is a waste of time and energy to remain silent. One of the reasons we may stay silent is because we have convinced ourselves Jesus isn’t able to forgive.